These skulls were photographed by Robert Connolly on his trip around the world during which he was collecting materials about ancient civilizations. The discovery of unusual skulls was thus an unintended "spinoff" of his efforts. Robert Connolly published his photographs on a CD-ROM, titled "The Search For Ancient Wisdom", Cambrix, 1-800-992-8781, in 1995. The data about the skulls is incomplete, and that makes the correct assessment of their age, context with other hominids, as well as placement of their origin extremely difficult. Some of the skulls are very distinct, as if they belong to entirely different species, remotely similar to genus Homo. The first thing that attracts attention is the size and shape of the cranium in all the specimens. There are 4 different groups represented in the pictures. As a matter of convenience, I labeled them "cone-head", "jack-o-lantern" or "J" and "M" based on the shape of the skull, except the first and possibly earliest type of skull, which I call "premodern". When some of these pictures (the first two) were posted on CompuServe more than year ago, the majority of people assumed that they represented an example of binding of the head, well known to be in fashion in ancient Nubia, Egypt and other cultures. 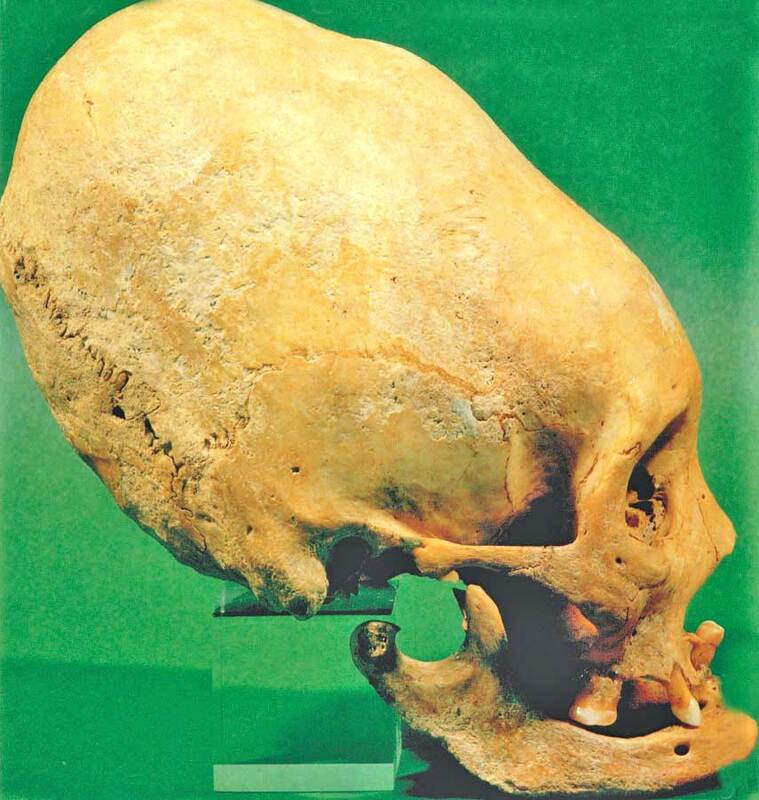 The problem with this theory is that the inside of the cranium of the mentioned skulls, although elongated and with a back sloping, flattened forehead, have the same capacity as normal human skulls; the only difference is the shape achieved by frontal and side deformations. They are actually more similar to the first type of skull (premodern) with the rounded back, than the cone-head type. The cone-shaped types of skull are not found amongst the usual skull-binding samples. The first skull presents problems of its own. The frontal part of the skull seems to belong to an individual of the pre-Neanderthal family, but the lower jaw, though more robust than modern human type, has a modern shape and characteristics. The shape of the cranium does not have any comparison with the Erectus, Neanderthal types, nor the modern human type. Some minor Neanderthal characteristics are present, as is the occipital ridge on the bottom back of the skull and the flattened bottom of the cranium, other characteristics point more towards Homo Erectus. The angle of the cranial bottom is, though, unusual. We cannot exclude the possibility of a deformed individual in this case, but it is highly unlikely that the angle of the frontal part would require a modification of the lower jaw in the process of growing to resemble modern human types with their projected chin rim. The answer seems to be that the skull belongs to a representative of an unknown premodern human or humanoid type. As is obvious from the comparison with a modern human skull, the cranial capacity lies within the modern human range. This is not surprising, since the late Neanderthals and early modern humans (Cro-Magnon) had larger cranial capacities (both roughly 1600 cm3 to 1750 cm3) than modern humans (av. 1450 cm3). The decrease of the cranial capacity (sudden at that -- the specimens of modern humans after about 10500 BCE have smaller craniums) is a puzzling matter, but that's another story. No less puzzling is what a representative of a premodern human type is doing on the South American continent. According to the orthodox anthropology, this skull simply does not exist, because it cannot be. Textbooks' oldest date of appearance of humans in North America is about 35000 BC and much later for South America, based on the diffusion theory assumptions. The only accepted human types entering the continent are of the modern anatomy. There are some other sources that place all types of human genus in both Americas at much earlier dates based on numerous anomalous finds, but the academe sticks to its preconceived notions, no matter what. It's safer. 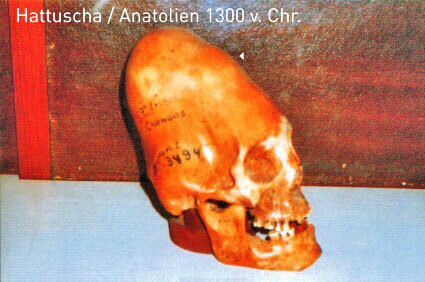 The "premodern" skull and the following three specimens were found in the Paracas region of Peru. It does not necessarily mean that they are related. There is some possibility that the "premodern" is in fact a precursor of the "cone-head" type, but since we do not have any dating analysis at hand, we may only speculate in this regard. The "cone-head" type is very unusual because of the cranial shape. Here we have three specimens, which exclude the possibility of random or artificial deformation (the already mentioned Nubian deformations had quite a number of individual variations). They have individual characteristics within the range of overall morphology. There is no doubt that they are closely related and possibly represent quite a distinct branch of the genus Homo, if not an entirely different species. The comparison of the C1 with a modern human skull has slight inaccuracies, caused by a degree of distortion when rotating the skull shape into position. As is obvious from C2 and C3, the angle of the bottom part of the cranium does not deviate from normal. However, the general proportions are correct. The shape of the skull may be a biological response - a survival of the species mechanism - to increase the brain mass without the danger of relegating the species to extinction and keeping a viable biological reproduction intact. However, since we do not see the representatives of the "cone-head" type in modern population, something prevented the type becoming as widespread as it is in the case of present-day moderns. The "J" type of skull presents different sets of problems. It is an equivalent of the modern type of skull in all respects, with only several factors out of proportion. Less significant is the size of eye sockets which are about 15% larger than in modern populations. More significant is the enormity of the cranial vault. The estimated cranial capacity ranges between minimum of 2600 cm3 to 3200 cm3. Again, the age of the specimen is unknown and so far I am not aware of other specimens of this type. The variation on a theme may be the "M" type of skull which is even more bizarre than all the previous skulls. The "M" type of skull is incomplete, as the lower part of the facial area is concerned. What is apparent from the remnants of the facial portion is that the characteristics are entirely within the range of a normal human skull. 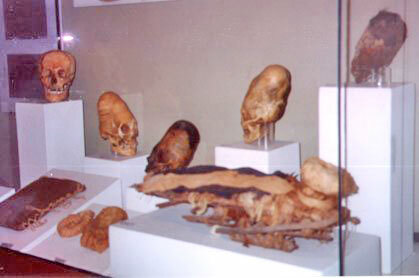 The cranial vault, on the other hand, is the largest amongst the displayed specimens. Also, the two protruding "lobes" are highly anomalous. The cranial capacity can be estimated safely above 3000 cm3 mark. Both "J" and "M" types are bordering on biological impossibility. The only explanation I can imagine for the specimens to be naturally born is if the neoteny (the ability of the species to prolong the growth period before maturing) of both groups had been expanded beyond the range for a modern type of human, for the skull to grow to such a size. That may also mean the average life span of these specimens may have been substantially longer than the average for the modern human type. Any conjectures that what these specimens represent are simply deformations or pathological cases can be hardly substantiated. Anomalous types of growth or shapes appear from time to time in the modern human population, however, these occurrences are still within the range of the given species. The largest skull documented in the medical literature had the cranial capacity of 1980 cm3, however, the shape of the skull was normal. Also, it is necessary to keep in mind that any pathological growth of the cranium has dire consequences for the afflicted individual at the early stage of the development, practically without exception. Nature is very unforgiving in this respect. All the specimens presented here were mature individuals. The capacity of the cranial vault (and thus the brain mass) and intelligence is not necessarily indicated by the other. The individual with the largest skull, already mentioned above, was a retarded man, while Anatole France with his 1100 cm3 was quite a brilliant writer.